X-Men: The Blue and Yellow Era (Review) – AiPT! I’m crazy about X-Men and I’ve read most of the essential arcs and events, from Proteus through Onslaught. But you know what I never bothered with? The early issues. The stuff before the Claremont/Byrne era. Or, the old blue and yellow uniform days. That original X-Men line-up from the Silver Age never constituted my favorite characters and I knew the long and short of their adventures through trading cards and references, but I never read the stories first hand. So I figured I’d finally get down to it and picked up Marvel Masterworks: The X-Men Vol. 1 – 8 and Avengers: The Coming of the Beast. Those 9 volumes succinctly cover all the vital X-Men stories before Giant-Size X-Men #1 came along. 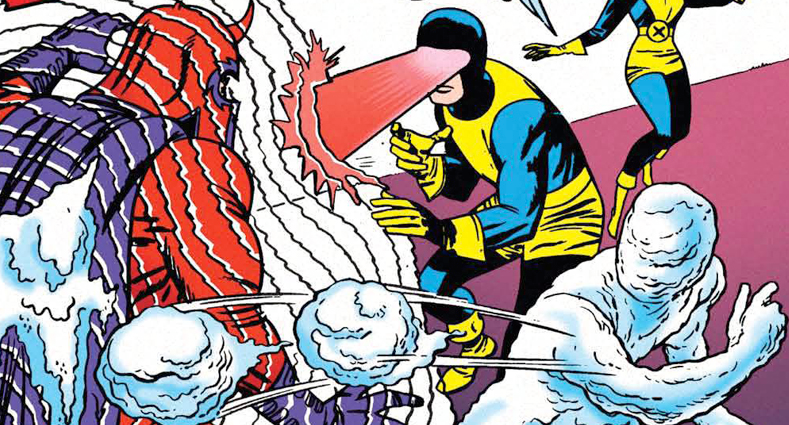 Stan Lee’s run on X-Men contains easily the most iconic issues of the series from its infant days, introducing most of the heavy hitters who remain central to the book. Also some dregs, but you know. I was really excited reading these stories: Their first encounters with Magneto, the Blob, the Brotherhood of Evil Mutants, Ka-Zar, the Juggernaut and the Sentinels. Even the characters we don’t see much of anymore, such as the Vanisher, Unus, Lucifer and the Mimic were all colorful with unique powers and connections to the cast. Sometimes it takes three panels for a character to realize they’re about to step in a ditch and correct the situation. That’s just how Stan the Man rolled. But if you’re familiar with Lee’s style of writing then you’ve likely acclimated to that sort of thing by now. I wouldn’t categorize his work on X-Men as anything approaching his best stuff (his heart and soul was always in Amazing Spider-Man and Fantastic Four far more than any other title). However, there remains that quality of forward thinking and longform storytelling that made Marvel’s books stand out in the Silver Age when compared to their Distinguished Competition. There are excellent arcs in those first 19 issues and you can see some rapid improvement in terms of focus. Magneto and the Brotherhood of Evil Mutants comprise the bulk of the ongoing conflict, as Magneto tries scheme after scheme to topple the X-Men, ranging from failed recruitment drives (Namor, the Blob and Unus) to the debut of Asteroid M. Ultimately, Magneto and the Brotherhood are written out of the title fairly early, as Magneto and Toad are captured by the Stranger and taken to his cosmic petting zoo (no really), Mastermind is turned to stone and Quicksilver and Scarlet Witch are left to join the Avengers. And good riddance to them, too, because the book actively improved once they were out of the picture. There’s a great two-parter involving the Juggernaut, where an entire issue is spent building him up, with the battle not occurring until the second half. The pride of Lee’s run on X-Men, I think, is the three-issue Sentinel arc. We’ve seen the gist of this story retold a thousand times in almost every incarnation of the franchise (be it cartoons or movies); it’s quite possibly their most classic storyline from the pre-Claremont days. But it’s also the story were the idea of mutants being hated, feared and discriminated against by human society really comes to a head. And despite what Lee might say retroactively in interviews, that is NOT how the human/mutant relationship was portrayed when the book began. When the X-Men are first introduced, they’re treated less like Spider-Man and more like the Fantastic Four. The public loves them. Mutants being hated by humans was something Lee came up with later, but only AFTER he’d already played with the idea of mutants being celebrities that the world loved and adored. There are lots of other ideas that come and go at the whim of the writer, too. In X-Men #3, Professor X expresses a rather lecherous infatuation with Marvel Girl, intimating a love triangle between himself, her and Cyclops. The idea is promptly dropped because that’s pretty messed up, man. I don’t think it would be capitalized on until the Onslaught arc 30 years later. Then there are Magneto’s powers, which in these early days are whatever Lee wants them to be. It seemed that he had some designs on making Magneto a more direct evil opposite of Professor X, giving him much of the same mental powers the Professor had. Magneto could astral project and even hypnotize people with his mental commands (described as a byproduct of his “magnetic personality”). By the time Magneto escapes from the Stranger’s petting zoo, those powers are gone and never referenced again. Well, that was a short four years. From there on out, they’re alternatively treated as a team of heroes and sometimes still treated as students. Whenever it’s convenient to the plot. They’d get a more appropriate (and more earned) graduation during Roy Thomas’s run, in X-Men #39, but I don’t want to get ahead of myself. Overall, Lee’s run is not his best work, no. But it sets up most of the concepts and characters that would form the foundation of the X-Men franchise and these storylines are still being retold fifty years later. And while this also doesn’t represent Jack Kirby’s best work, either, you’ll still find some standout pencils on his part. I’m rather partial to X-Men #10, the introduction of the Savage Land and all the weird monsters and creatures he goes absolutely bonkers with. Alex Toth also offers a one-issue performance on X-Men #12, albeit over Kirby’s layouts. When Roy Thomas took over X-Men, Stan Lee stayed on as editor. So I don’t really know how much of Thomas’s initial material was of his own imagination and how much was carrying out the unfinished plotlines left behind by Lee. His initial arc, X-Men #20-21, was a two-parter that saw the ultimate end of Professor X’s old foe Lucifer, tying up a dangling plot thread Lee had left behind in X-Men #9. So I imagine right off the bat he had to finish up Lee’s work. Now, let me just say that Roy Thomas is a great writer. His run on Conan the Barbarian constitutes one of the greatest comics of the 1970s. And that’s saying something, because the 1970s were positively spoiled with amazing comics (it’s my personal favorite decade for the medium). Thomas’s run on X-Men, however, does not constitute his best work. He was pretty new to the business when he started and you can definitely see him learning as he goes along. But things start out pretty rough and they don’t begin to get better until a few months before the book was “cancelled” (actually, relegated to reprints for several years, but essentially cancelled). Thomas starts out by pitting the X-Men against some of the absolute worst villains you can think of. There’s Count Nefaria, who assembles a legion of morts to embarrass themselves: The Scarecrow (not even remotely as cool as the Distinguished Competition’s version), the Porcupine (he fights by being pointy), the Eel (who gets knocked out within five panels of introducing himself), Plantman (is this a reject Robot Master?) and the terrifying Unicorn (whose powers and costume do nothing to intimate the fanciful fairy tale equine). It is not good. From there, the X-Men do battle with losers like the Locust, El Tigre, the Warlock, the Cobalt Man and the Super Adaptoid. There’s an arc in there that’s kind of interesting, as the X-Men initiate their first new member, the ex-villain Mimic (a character Lee introduced right before he left). He flunks out of the group, but he does shake up the tedium of the roster a bit for three issues. Perhaps the most ambitious aspect of Thomas’s early run on X-Men was the lengthy Factor Three arc that began in X-Men #28 and continued through X-Men #39; a full year’s-worth of stories, which was uncommon for the Silver Age. It’s pretty unfocused and mostly simmers in the background as the X-Men fight villains that are dispatched to do them harm. The Factor Three arc also functions as a more meaningful “graduation” for the characters than the one Lee jumped the gun with early into the book. Upon defeating the Mutant Master and a quartet of their established rogues (the Blob, Unus, Vanisher, Mastermind), the Professor gives them all unique uniforms, signifying that they are no longer students in training, but fully formed graduates and individuals. The “graduation” idea would go a step further when Professor X dies battling some nobody called the Sub-Human in X-Men #42. Don’t worry, he comes back. Thomas shares some of the writing duties with Arnold Drake, whose most famous contribution is the arc introducing Mesmero, Eric the Red and Lorna Dane/Polaris. Thomas comes back after that and sees things through to the end, even shaking up the roster some more by adding another new X-Man in addition to Lorna: Havok. What really makes the tail end of Thomas’s run worth picking up isn’t so much the writing, but the artwork. Werner Roth had been the artist for the lion’s share of Thomas’s issues and while Roth was fundamentally sound, his art was very typical, almost workmanlike. There was next to no pizzazz like you’d see from Kirby or Ditko or Romita, which I suppose made Roth an appropriate fit, as Thomas’s storytelling was equally bland most of the time. So the book got an injection of life as higher caliber artists began to parade through the title for brief stints. Don Heck of Iron Man and Avengers fame stuck around for a while, Jim Steranko produced two stunning issues, and Barry Windsor-Smith (of the aforementioned Conan the Barbarian) got in a lovely issue. Then Neil Adams took the reins with X-Men #56 and it’s almost a shame the book got cancelled. Adams’s art rises above the lackluster scripting and these issues look epic and glorious even when covering the most clichéd content. I mean, just look at the jump from X-Men #55 (Roth) to X-Men #56 (Adams). Same stupid villain (the Living Pharaoh/Monolith), but damn if the art doesn’t make it so much more energetic and thrilling. The final issues see a showdown with Magneto in the Savage Land, the introduction of Sauron (who actually does name himself after the Tolkien character), the introduction of Sunfire, a pretty good Sentinel arc until the robots blast off into space to destroy the sun, and the ultimate return of Professor X (who traded places with the Changeling, who is now dead). Reading through the whole run, the book didn’t start to pop until they got some more ambitious artists on the title. But by then, I imagine it was too little too late and nothing could save the series. I don’t want to disparage Thomas’s (and Drake’s) whole run, because there is some good stuff mixed in there, but much of it is excruciatingly bland and forgettable. While the X-Men comic was stuck in reprints from #67 to #93, the characters survived as guest stars in numerous crossovers. Steve Englehart and Len Wein were the X-Men’s most vocal supporters, keeping them alive in the books they were in charge of. I don’t want to spend too much time talking about these tales, as they aren’t all very important; just a lot of “hi, remember us?” cameos from the X-Men before they drift off back into the unemployment line. But a few of these stories are pretty interesting, such as a final battle with Magneto and the Brotherhood in Defenders #15-16 that sees the Master of Magnetism undergo another ludicrously humiliating defeat (this time turned into a baby, as if the cosmic petting zoo wasn’t embarrassing enough). As the characters make their final rounds on the cameo circuit (sometimes mistakenly drawn in the blue and yellow duds by artists with unresponsive editors), the appearances end with Professor X summoning the X-Men for a “secret mission”. This leads right into Giant-Size X-Men #1. The secret mission doesn’t go well. What really surprised me about this in-between era for the series is that the X-Men’s breakout character was… The Beast! Of all the X-Men, he was the one to get the most mileage as a solo act, first starring in a string of stories published in Amazing Adventures, then having his story progress through issues of Incredible Hulk, and then ultimately joining the Avengers where he remained for quite some time. It’s kind of hard to believe, as the break-out X-Man from my generation (and every generation afterward) has been Wolverine. But before he came around to hog the spotlight, it was Hank McCoy who graduated from the X-Men as his own fully formed character. Kind of a shame, in retrospect, that he sort of regressed as an independent character and dissolved back into the scenery of the X-Men comics. This was definitely fun on an educational level, I guess; reading all these stories that I only ever knew as the briefest of summaries. There’s a lot of bad in this era and much of it feels unfocused and episodic, even when the more ambitious arcs are trying to string a continuity along. But there’s good in there, too, and I really think the run is bookended well. Lee’s initial issues introduce just about everything that would go on to be important about the franchise. Thomas and Adams leave it on a high note with some stellar art and a few good arcs featuring those classic villains Lee established. Everything in the middle is take it or leave it and you might find yourself pulling out your hair as subplots are constantly introduced and then forgotten altogether (I didn’t even mention the love triangle between Scott, Jean and Warren that goes nowhere, or Jean leaving the X-Men to go to college which lasted until Thomas got bored with it). God, that never fails to make me laugh.